The unique U-shape design provides the perfect balance between comfort and support for better quality sleep. 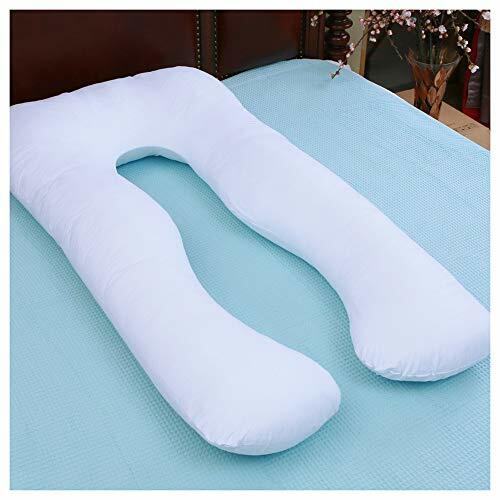 Rest on it, it will create a belly support position for sleeping, reading, nursing, watching TV, and breastfeeding.A favorite for expecting mothers and people suffering from hip or back pain, people in physical therapy or recovering from an injury, and anyone looking to get better sleep. The outer fabric is 100% cotton. Filled with high quality polyfill material, so this maternity pillow offers long lasting resilience. The invisible zipper removable pillow cover is machine-washable, and it’s easy to remove and clean. This pregnancy / maternity body pillow is perfect for pregnancy support, nursing, reading, or watching TV. Guarantee – We will give you 30-day refund or exchange if you are not satisfied with our pillow.